For those of you who have been following along with this blog, my first attempt at making gnocchi was back last January, when I made parsnip gnocchi. I must admit, I haven’t actually made gnocchi since then. But I ran across this recipe and just knew I needed to try it. The time had come for me to make sweet potato gnocchi! As per usual, I looked up several other recipes and tried to combine the best of the them, with my own twist. The main thing was that I did not add any honey to the dough. I didn’t want super sweet gnocchi – I wanted them slightly sweet, but mostly savory. I also did not add much parmesan cheese, mostly just because I didn’t have very much. What I ended up doing was cooking the sweet potato and regular potato in the microwave for a few minutes – its much much faster than roasting. Then I added the egg, salt, a little cheese, and some nutmeg. Nutmeg is a wonderful addition to otherwise savory dishes. I added a little flour, but only a couple tablespoons. Since it was still to sticky to roll and cut, like one is supposed to, I shaped gnocchi with spoons, and dropped them into the boiling water. The result was equally good, although much larger, gnocchi. I made the balsamic sauce mostly according to directions, but I used regular onions instead of shallots, and thinned it out with only a little bit of pasta water. Since this was my first cooking experiment post-vacation, I decided to make it a whole meal experience. I served it with a side of kale (sauteed in olive oil with some garlic) and a glass of red wine (a particularly good Australian Shiraz). Result was a delicious meal that felt like something for a special occasion. Conclusion: you can make delicious gnocchi out of many different veggies. Beets may be difficult, but I’m thinking butternut squash gnocchi may appear in my future. 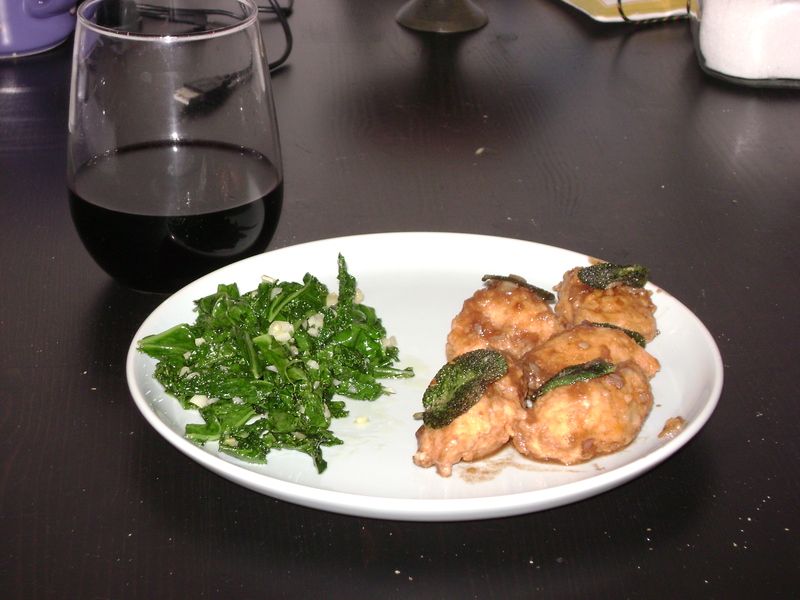 The sauce and the crispy sage were what took this recipe above and beyond though. It just added the necessary extra oomph. Gnocchi can be a bit bland, so its important to find a good complimentary sauce or topping, that doesn’t obscure the taste, but raises the dish to the next level.